Without a clear vision we can’t focus, will not reach our goals, and will fail at fulfilling the purposes of God. Without vision, people and churches lose the vitality that makes them feel alive. This Sunday I will talk about the state of our church, our finances, how the year ended, and some of the action we will take in 2011. We need to make changes in some areas. We will reaffirm what’s working and sack what’s not. I will be very transparent. I love the Church. I love Pace Community Church. If you were to strap a heart monitor to my chest when someone is talking about the beauty and potential of the church, it would register a rapid increase in my heart rate. After all these years, my passion is not fading. On the contrary, it’s growing in intensity. What PCC needs is a God-honoring, kingdom-advancing, heart-thumbing vision and a nuts-&-bolts plan to get it done! I have been very busy this week. Not only are we wrapping up 2010, but we are pre-planning for 2011. This has had me pressed for time and kept me from blogging for a couple of days. The end of the year is when we study data, are crunching the numbers, evaluating effectiveness, planning the budget, talking about restructuring & realignment matters, new ministry initiatives, facilities, and expenses. 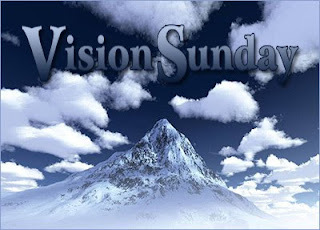 The message for this weekend entitled, “Vision Sunday.” This is the weekend that I normally share a “State of the Church” address, so I thought it would be a good idea to talk about vision and what lies ahead for us in 2011. As the Bible says…..
Changes are in store for us. Our current reality dictates our need to reorganize & restructure some areas. Business as usual is not cutting it. 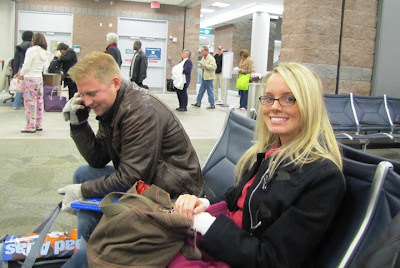 My son and daughter in-law, Jonathan & Jamie, flew to Denver CO Monday morning for a ski vacation – their first ever. The day started out pretty stressful. Their starting flight out of Pensacola was cancelled, so they had to catch a later flight, which delayed their departure. This meant they missed their connecting flight. You get the idea. To make a long story short, they eventually made their destination after being rerouted through Atlanta GA and Minneapolis Minnesota. This created a little distress for me and Renae, worrying about them. While they are grown up, they are still our children and we were anxious for them. BTW, this was Jamie’s first airline flight. Talked to Jonathan tonight. They are having a blast. There is eight feet of snow on the ground in Winter Park CO; fresh powder on the slopes; and gorgeous weather in the daytime. Jamie has learned to ski very quickly and is doing very well. Today, the two of them took a snow mobile ride through the mountains and up to the Continental Divide, which has an elevation of 14,000 ft. He said the view was spectacular. Jonathan and Jamie are flying home on Saturday. If Renae and I could afford it, we would go snow skiing every year – it’s that much fun. My home owners insurance has increased $1900 for 2011. My health insurance increased $1000 in 2010 and is going up even more in 2011! Not happy. This series will contain some of the strongest content (meat) that I have ever taught – much like the Malachi series in January of 2010 – and is not for the casual Christian. I feel led to clearly communicate just exactly what Jesus had to say about salvation, so that we can start the year off with a strong discipleship emphasis. This will be an expository (verse-by-verse) message series that will examine Jesus’ encounter with several different people who came to Him for salvation. It’s worth mentioning here that not everyone who came to Him for salvation received eternal life. Many turned away from Him just as lost as they were when they approached him. Some of you will be deeply challenged and your belief-system shaken after hearing the words of Jesus and what He had to say about salvation. If His words cause anyone to discard their false assumptoins about eternal life and intsead gain a truly Biblical understanding, then they will be the stronger for it. This is going to be a strong word. I bought a cast net the other day. It’s a beauty - an 8 ½ footer. If I can get proficient at throwing it, I hope to catch some early spring mullet. If I catch fish, I’ll be having a few fish fry’s at my house. My father was an expert at cast-netting. I can remember fishing with him from my earliest years as a child. I’ve never been as good as he was. There is a reason that I am still driving a 1998 Tahoe – because I’ve been saving the (car payment) money and applying it to our mortgage. This truck is thirteen years old and has 198,000 miles on it. That’s a lot of time to save a lot of money. For me, the discipline of being frugal is well worth the benefit. If everything goes according to plan, I’m going to buy myself a fishing boat in two or three months. Renae and I are dying to get out on the water again. When we first married I had a small 14 ft boat. We used it often; for fishing, for picnicking, and for a variety of other recreational activities. But after the first baby came along, (three years into our marriage), it put a halt on our boating trips. Eventually, I had to sell the boat. Now that our children are grown and we are close to being debt-free, it’s time for us to do what we were doing at the beginning – spending time on the water. Can’t wait. My youngest son, Nathan, is close to finishing college. He is one semester from earning his bachelors degree; he attends UWF. He changes jobs next week too; he is leaving Chili’s in Pace (where he has worked since they opened) and has taken a management position at Opps Alley. This will be good experience for him and will help build his resume’. Attendance was lower than normal. It was expected; the Sunday after Christmas is always this way. It was a good decision to have one service. It’s apparent that we have some stuff going on at PCC! Wow is all I can say. The Friday night Christmas Eve Communion Service was big hit. A lot of people told me this morning how much they thoroughly enjoyed the service. The attendance on Christmas Eve blew me away! We had a packed house! As attendance increases at PCC, the holiday schedule will mean more services and more stress, and I’ll be glad to deal with it. But I have really enjoyed that laid back feel of things lately. The Christmas season has been enjoyable. Spending time with family and friends was especially fulfilling for me. 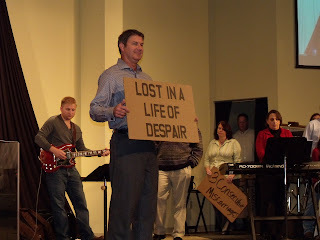 Last Sunday I had a “God moment” during the service. As I listened to the testimony of Ray & Lynda and watched the cardboard testimonies, I thought to myself, “12 ½ years ago we launched this enterprise with seven people in my living room – but look at us now! Look at all these people… all these testimonies… all these stories of life-change… all the things that God has done!” My cup was running over. We have received communion twice in the last six weeks, heard testimonies from three different families over three Sundays, witnessed the cardboard testimony, conducted a Christmas Eve service, and ended the year with a video of 2010 activates at PCC. It’s been a nice holiday schedule. No teen activities this Wednesday night. No band practice this Wednesday night. After New Years we're going to be bustin some new territory. 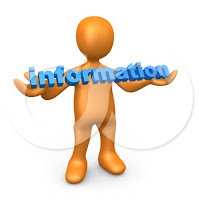 Keep checking back to get the info. Here are two blogs I wrote back in August of this year. The content represents what we are activlty doing here at PCC. We are being very intentional and deliberate about developing others (including younger people) for leadership as part of our strategy for the future. Read these two entries if you'd like to have a better understanding of what's going on around here. I think we have a very bright future ahead of us. We’ve all seen them. Plenty of them have passed through the doors of PCC. They are everywhere, in every church, and every city. You know who I’m talking about. Right? Church hoppers. Church hoppers are those people who hop from church to church on a regular basis without ever becoming established in a local congregation for any length of time. The reasons for church hopping are as numerous as the people doing it, but the common denominator shared among them all is they want you to do more for them. No matter WHAT you do or HOW MUCH you do, they will eventually get bored or get offended and move on. They all have the same M.O. – the grass is always greener somewhere else. i.e., The music is too loud or too slow here but just right over there; or some spiritual fat cat wants to be the big fish in a little pond so he finds a small church where he can be boss; or the children’s ministry is really cool at the other church; or the theological flavor over there suits my appetite better than here; or the pastor down the street is deeper. You get the idea. These folks – God bless them – believe the church exists primarily to serve them and cater to their every desire, instead of them existing to serve Christ and His Church. It’s almost as if they have a country club mentality where you have to bend over backwards to appease them – you know, “the customer is always right.” They are the product of a generation that has been told you can “have it your way” and are accursed with short attention spans. You can’t make disciples out of people like this. They are unstable like shifting sand. A church built on people like this is a house of cards. What we need – what Pace Community Church needs – is people who understand God’s will for the local church, who will buy into the Great Commission and will sacrificially serve for the cause of Christ. Church hoppers will not commit to any local church because they believe they are different; that they have special insights, special needs, or possess superior spiritual enlightenment unlike the rest of us mere mortals. So they flit from church to church filling their plate where their craving for the moment is satisfied. Its turns the Body of Christ into a commodity. Church hoppers bring their families to church like they are on a trip to McDonald's. It is disrespectful. The church is the Body of Christ and is the Bride of Christ – to be treated with respect. It turns preaching into an audition. No pastor wants you to come to church just because you think he is a good preacher. He wants you to hear what he’s got to say because it is God’s Word – not his – and them put it into practice like a committed believer should. People who are only coming to hear a good sermon are there only to see a performance. Church hopping has its consequences. It will isolate you. You will develop a critical view of the church (and all churches). A judgmental spirit will get hold of you; “I don’t like this and I don’t like that” will become your constant refrain. Church hopping puts you and your family on a spiritual starvation diet too; you never have a chance to get deeply involved in any of the church’s ministries. Moreover, the church hopper has little support and fewer connections with other believers, thus missing one of the greatest benefits of bonding with one group. Here’s my advice to church leaders at PCC: When you encounter a church hopper, CALL THEM OUT. Tell them that visiting churches is a good thing to do and they should continue their search until they find the place where God wants them to serve – but never to be a church hopper. Also be sure to communicate to them that we have little tolerance for church hopping around here; we are trying to make disciples. Church hopping needs to be called for what it is – shallow, immature, self-centered, and narcissistic. SPEAK TRUTH INTO THEIR LIFE. Do not placate them and their silly requests. “We’d stay if you had a cry room with a video feed." Instead, remind them that a video feed is an expensive luxury, not a necessity for church attendance. Call them out. Or if they complain that there isn’t a high enough adult-to-child ratio in the children’s ministry, INSIST THEY SIGN UP and VOLUNTEER to to help make it better. Then PUT THEM TO WORK! Confront these consumers in kindness and remind them that Christianity is about serving and sacrifice. Otherwise, kindly invite these hoppers to keep on hopping. Since October we changed the routine a bit and as a result have been experiencing great things at Pace Community Church. I took a break from my regular preaching routine (of teaching through books of the Bible) and did a couple of topical series; (1) Sanctification, and (2) Knowing the Will of God. It has been a refreshing change for us and beneficial. But the month of December has been the most different. For three Sunday’s we’ve had families from our congregation take the stage and testify in the morning service as part of the message. They spoke about their spiritual journey, painful chapters in their life, even the crises of faith they have faced. To say it has been moving would be an understatement; it has been very dramatic and deeply convincing. I so appreciate the transparency and authenticity of these people. I must confess to you that it is not possible for us to do this kind of service each week, (working through the details is very time consuming, etc.). On the other hand, I recognize how effective these type of church services are and think it would be a good idea if we incorporated this type of format on a more regular basis. WHAT DO YOU THINK? Would you like to hear more? Leave me a comment (here or on Facebook). THIS SUNDAY is going to be a great day too. I was able to preview a first viewing of the video that Paul Thornton has put together for us entitled, “The Year in Pictures” and I must tell you I was very impressed. There is still a little bit of editing to finish up, but it’s going to be very enjoyable to watch. YOU DON’T WANT TO MISS THIS! Pace Community Church is an exciting church and there is a lot going on; more than I can keep up with. The first Sunday in January I will be sharing a message entitled “Our Future is in the New.” This will be a vision-casting message and I will outline what (I believe) God would have us attempt in 2011. I could not be more hopeful about PCC than I am right now. The following Sunday we will begin a message series from the book of Genesis on the LIFE OF JOSEPH. This will be a verse-by-verse exposition of one of the greatest stories in the entire Bible. Except for Jesus, the story of Joseph is one of the greatest examples of godly character and integrity in the Bible.. Trust me, this will not be some boring exposé on outdated events. It's going to be Biblical truth with modern-day relevance and application. We’ll talk about dysfunctional families, generational curses, sexual tension in the workplace, suffering for doing good, lessons from the school of hard knocks, on-the-job integrity, reaping & sowing, forgiveness among family members, and much, much more. It is going to be LIFE CHANGING for some people and EVERYONE is going to LEARN the WORD OF GOD! 1. What were you doing before planting & pastoring Pace Community Church? I was pastoring a church near Gainesville Florida. BTW, I’m originally from this area. Even though I have moved away a couple of times, this is my home. 2. What kind of Bible do you use? For personal use, primarily the King James Version (KJV) because this is the one I cut my spiritual teeth on and I am most familiar with it. I also use the New International Version (NIV) and the New King James Version (NKJV) when teaching because it is much easier for people to follow along. I think all translations have their strengths and weaknesses. 3. Do you experience stage fright? No, not any more. When I first started preaching/teaching I would experience stage fright so bad that I would literally be sick for two/three days before the event. I would get nauseated, have butterflies in my stomach, and actually throw up. By the time I took the pulpit I would be weak in body and my mouth as dry as cotton. How I survived those days I will never know. But it’s not a problem any longer. I am totally relaxed and completely at home in front of my church family. 4. Do you offer counseling? Not very much. I’m not good at it. It’s very time consuming and produces limited results. Besides, in counseling sessions I usually find out more about people than I really need to know, which usually results in the person leaving our church. What I mean is, people are sometimes too revealing in sharing the intimate details of their life; and the more revealing they are, the more likely they will eventually leave our church because of embarrassment. 5. What do you do during the week? I know some people think pastors only work one day a week, but my week is always very busy and full…. to a fault. I spend a lot of time reading, studying, strategizing, and planning. I oversee and supervise a lot of things going on at PCC… too much really. I am also too deeply involved in numerous mundane tasks that I should have nothing to do with. 6. If you were not a pastor what you would be doing? I would be a movie star. What else? 7. How long are you planning to stay at Pace Community Church? If God will allow me, for the rest of my life or until I cease to be effective. I’m not looking for another church to go to. This is where I belong. 8. Do you eat corndogs? No. Never. Corndogs are cancer on a stick. I heard a medical doctor say that once, and it was good enough for me. 9. What’s your favorite place you’ve been to on a vacation? Without exception, the Rocky Mountains. Short of that, anywhere outdoors and away from urban areas & crowds of people. 10. How would you describe spiritual maturity? Maturity isn’t measured by how high you can lift your hands when you feel good, but by how straight you walk in obedience when you don’t. A lot of preachers love to pontificate with great swelling words of verbosity and pious platitudes. Under the guise of being intelligent, they take simple truths from God’s Word and muddy it up with lofty words that no one can understand. They think they are deep, when in fact they are actually painting a cloudy picture that very few people can figure out. Is it really necessary to know Latin? In stark contrast, Jesus Christ was the greatest communicator who ever lived, yet He didn’t use theological jargon. He spoke in simple terms that normal people could understand. We need to remember that Jesus did not speak the classical Greek language of the scholar. He spoke Aramaic, which was the common street language of the day. He was a master storyteller. He talked about birds, flowers, lost coins, sheep, plows, wells, farmers, planting seeds, vineyards, grapes, wine, wineskins, candles, bushels and other everyday objects that people could relate to. Jesus taught profound truths in simple ways; and that’s why the Bible says the COMMON PEOPLE HEARD HIM GLADLY . 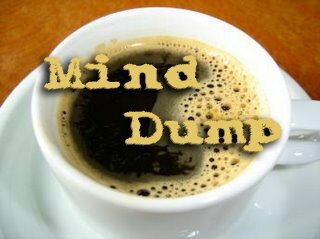 Some pastors today love to show-off their knowledge by using a lot of Greek words and academic terms in their preaching. They speak in an “unknown tongue” without even being charismatic. Pastors need to realize that virtually no one cares as much about Greek rhetoric as much as they do! I love the practicality and simplicity of Jesus’ teaching. It was clear, relevant, and applicable. He aimed for application because His goal was to transform people, not merely inform them. This is the kind of preaching that is needed in churches today. It changes lives. Pace Community Church began with seven people in my living room almost thirteen years ago. Those seven people were: me, my wife Renae, my mother Jewel, Renae’s mother Carolyn, Renae’s sister and brother in-law DJ & Chuck, and my father (who has since passed away). I remember the seven of us being in my living room in 1998 and hand addressing more than 5000 envelops that contained an open letter to the community about the beginning of our new church. We were so nervous about launching this fledging church, not even sure if it was going to work out. After today’s service, I realized (that even though I’ve always had a vision of God doing great things) I could have never imagined the specifics of what He was going to do through the ministry of this church over the long term. There are so many people who have experienced so many good things through PCC. Today I realized that this church has had steady kingdom impact over the years. We are not a splash in the pan. We are here to stay. Why? God is in this thing. Click these pictures for an enlarged view. Then backspace to return here. There are more pictures below. I taught for ten minutes today. Sometimes shorter sermons are more memorable. Ray and Lynda Patterson testified as part of the morning message. They hit it out of the ball park. It was very, very effective. They told of their spiritual journey; how the came to PCC; were reluctant of any church that was meeting in a school cafeteria; how they were warmly embraced by the PCC family; how they committed their lives to Christ; about their son’s motorcycle accident; how the PCC family rallied around them; how they learned to trust God through it all, no matter the outcome; and the power of prayer. Wow! That was followed by the Cardboard Testimony of twenty-five others. The stories of these people were remarkable! Only God has the power to change lives like this. I’m glad that He has allowed me to be a part of what He is doing in the earth. What we witnessed on the stage today was a DEMONSTRATION of GOD’S POWER in changing lives – not the enticing words of mans wisdom – and it affirmed that our faith at PCC rests in the power of God (2 Corinthians 2:5-6). A lot of people cried today. A lot. I was as deeply moved in both services. In fact, I think I was more moved in the second service. I cried all the way through Ray/Lynda’s testimony, and I couldn’t stop clapping and crying during the cardboard testimony. At one point, as people were walking out onto the stage and I was sitting on the front row, I had this epiphany: All these people are God’s sheep… and this is why we do what we do. As a shepherd, I could not have had more overflowing joy. Attendance was 518 (which includes a double count of some people). And you should have seen the parking lot; it was jammed to capacity! The singers and band did an excellent job too. There’s a lot of diversity up there now… a good thing. Although I didn't play in the band today, it was good to have Falicia (a new guitarist) and Nathan (my son, and bass player) performing during the cardboard testimony. It's been a while since Nathan has played with us. Jewel said, Ray & Lynda...thank you for sharing your spiritual journey with us this a.m...You are two remarkable people...your faith & trust in God during the darkest time in your lives is some of the strongest that I have ever witnessed...your faith never wavered during those difficult days. "Thank you Lord for sending Ray & Lynda to PCC" They are an inspiration to everyone they meet. Jewel also said, I cried during our worship song service this a.m...I cried listening to the testimony of 2 special friends whose faith never wavered when the doctor told them their son would probably not live...I cried when 25 people of PCC participated in our Card Board Testimonies...lives changed by the power of God...Today was a "tears of joy & thankfulness" for me.. Miracles do happen! Alyssa said, Blessed to be a part of a fantastic church family! PCC is a great place to get your relationship with God where it should be! Sharon said, What an awesome service in church this morning. "If it didn't ring your bell your clapper is missing." Thank you Lord for your presence today. Butch said, Worth reposting: I belong to an awesome church. It's a place where I'm loved "warts and all"!!! Richelle said, His gracious healing power is amazing! To see all the cardboard testimonies this morning was a blessed reminder that I am not alone and that I am truly doing life with my PCC family! Thank you all, and Ray and Linda, for your courage today. I can promise that you touched many lives today.....including mine! Tammy said, The service at church today was Awesome! God has performed so many miracles and blessed so many people! God is good all the time! Mary said, Another fantastic day at PCC. Patterson's and Cardboard testimonies were very moving and were a blessing to all. It is clear that God is at work and accomplishing powerful transformations in PCCers lives. This is apparent not only through the stories of victory over adversities, but through transformed lives now living for God. We serve an AWESOME God!! Ron B. said, Awesome family testimony today at church, proves our God hears our prayers. I saw a few wet eyes. Cardboard testimonies where also awesome. If you missed it, you missed a blessing. Robert said, Cardboard testimonies at church and a wonderful testimony from Ray & Linda P. Its so good to be a part of such a wonderful church (PCC) I went to lunch after that with my family to celebrate my birthday . A totally awesome day! Rhonda said, Today's church service was transparent and real....only had to use a whole box of tissues! Christa said, Good day today!! 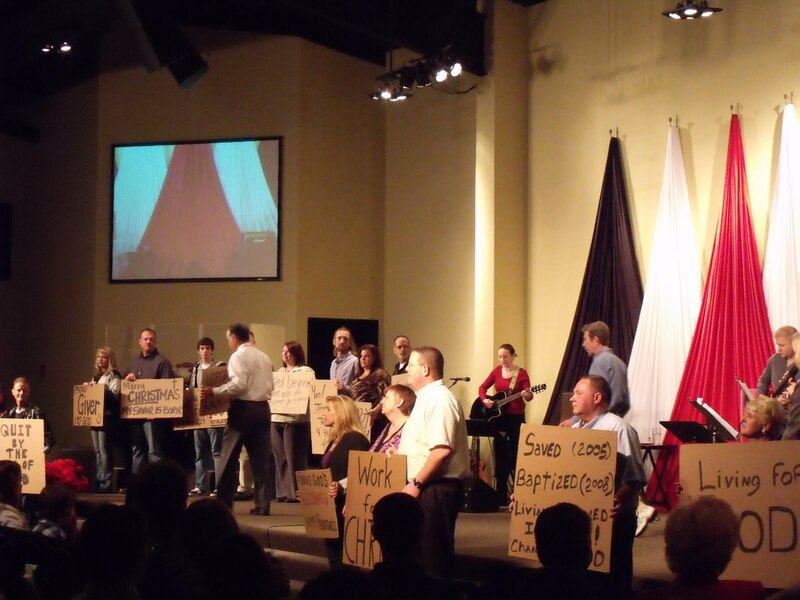 Cardboard testimonies at Church, I can't wait to see the video!! I am proud to go to Church with such an amazing group of people!!!! John said, I love Sunday, because I get to attend the most amazing church in the free world, or the unfree world for that matter. Pace Community Church. What a special and remarkable day!! The holiday season (since Thanksgiving) has been very enjoyable for me this year. Personally, I am very thank for my family and all good things there. In addition, I’ve a attended a variety of social events and holiday parties with people from the PCC family that I have thoroughly enjoyed. I’ve never enjoyed doing life with people like I do the people at PCC. In fact, 2010 has been one of the most enjoyable years ever during my time at PCC. Sure, we are wrestling with systemic challenges and need to get some stuff fixed around here, but I have never enjoyed our people so much. There are a lot of people at our church I really like. Plus, the fruitfulness of this ministry is really beginning to show itself. Now, if only that Robert H. would take me fishing. My family and I went out to lunch with a group after church today. Haven’t done that in a very long time and thoroughly enjoyed myself. I would like to do it more often. Awesome day. I’m glad I belong to God and to PCC. Click the pictures for an elarged view. Then backspace to return here. Click the pictures for an enlarged view. Then backspace to return here. 1. Listen as an ally – Listen to other people’s ideas first before thinking of reasons it won’t work. Always listen with the team in mind, not “me” first. 2. Focus on the task at hand – Focus on the conversation and don’t have side conversations or distractions. Cell phones off & no computers. Keep to the specific point of the conversation rather than trying to bring up another point or topic all together. 3. Silence means agreement – Everybody’s opinion is valued and needed, but if you don’t speak up on a subject it’s assumed you agree with what’s been said. There should be no “meetings in the parking lot after the meeting” so you can share your “real” opinion afterwards. One of the lessons we are forcing ourselves to learn is: Never do ministry alone. Always involve someone else. Better yet, do ministry in teams. I feel more needed if I’m the only one who knows how to do the job. And who doesn’t like to feel needed? It’s kind of nice when I stand out because no one else has been trained to do the job. While all the above may be true, it’s unhealthy. Our job is not only to get things done, it’s also to teach, mentor, and train others. When you always have someone with you in ministry, you accomplish much more. You give someone else an opportunity to serve. You build a relationship with an individual, and you make room for real ministry to happen “life-on-life.” You make sure the ministry doesn’t rely solely on you. You model true mentoring. You communicate that you are secure in your leadership and don’t need a role or title to define you. Do you answer the phones? Don’t do it alone. Do you run the copy machine? Don’t do it alone. Do you empty the trash cans or clean the bathrooms? Take someone with you. Do you operate a camera or video equipment? Show others how to do it. Are you a teacher? Start working with someone as a team-teacher. Do you hand out bulletins? Invite someone to join you. Do you lead a team? Find an apprentice who can take your place. Do you visit hospitals? Take someone with you. Yesterday I met with a local pastor who leads a neighboring church. Good friend of mine. We spent time over lunch catching up, talking about our families, kids, emotional health, and stuff like that. Joe (not his real name) and I have known each other for years. He has always been a source of encouragement to me. We have an accountability relationship with one another regarding personal matters, and also have a coaching/mentoring relationship in regards to church work. Once we caught up on personal stuff, we got down to business and talked about the ministry. Because he is from “outside” our church he has no personal preferences about anything we are doing “inside” our church. His opinions, therefore, are unbiased and serve the purpose of offering me insights that I often cannot see for myself. That’s why I invite him to speak candidly to me about anything we are discussing; even those things at PCC that I am personally invested in. He did that yesterday, seriously challenging my thinking on a few things. Funny thing, it wasn’t uncomfortable to hear what he had to say because I was able to receive his opinion as wisdom coming from an unbiased source, instead of it being an emotional argument motivated by someone’s self interest. For over two hours we talked. We talked about a lot of things. We even talked about the big item on the drawing board at PCC right now: TWO SERVICES or going back to one service. He did not hold back and offered his opinion freely. More importantly, his wisdom provided a different perspective. Things I didn’t see. It gave me a lot to think about. When I got back to the office I shared it with some of the staff. We agreed that his insights were something we should consider. Why have we had testimonies from members in our church family for the last two weeks? Because the most powerful sermons are lived, not merely preached. That's why we'll be doing it again this weekend. It’s been a long, long day. Haven’t been home since 7:30 this morning. I am bonked. All I can say about this mornings service is that is was very good. 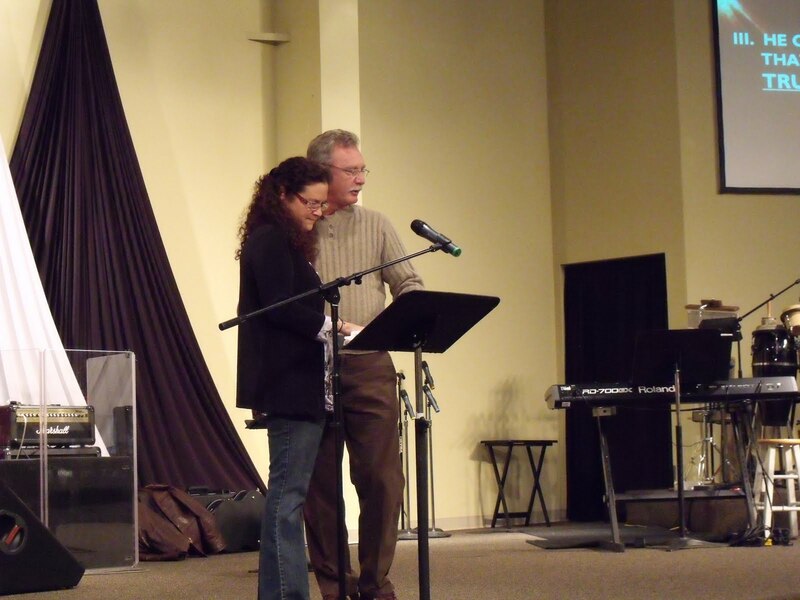 I preached for 15 minutes, setting up the testimony shared by Steve & Donna Knowlton. The story they told was very powerful. Steven was transparent as he told of a painful chapter in their life, and was also very encouraging by telling us how God and his church family has helped sustain them during this time. If you were there, you heard it all. The feedback we have received all day long has been UH-MAZING! People were very inspired and encouraged. Some of the comments from Facebook will be posted below. I’m glad I belong to Pace Community Church – a church that cares. I mentioned the nephew of Sandra B. in the morning service. I’m sorry to say that he is not going to make it. Renae, Ann L. Jamie C. and myself went to the hospital immediately after service. We had prayer with the family (most of whom we did not know). I was able to go to the beside of the man (Terry) and have prayer for him. We were hopeful. Unfortunately, about two hours ago the doctors told the family that he is gone, sent the parents home, and will turn off the ventilator tomorrow morning. We were very saddened by this. This now turns into a homicide. Renae, Ann L., and Sidney G. are at the hospital right now. I spent this evening with some of the finest people I know. We had dinner together. I don't remember a time in my life where I was more blessed with such awesome, healthy, and fun relationships. Today’s service had a few bumps in it... but that’s secondary to the content. There are certain days when you realize that it was just the vibe and the Spirit of God that made all the difference. We are a church where you never know what to expect. I’m pretty exicted about next weeks service. We will have another couple take the stage and share a personal story of tragedy that struck their life, their journey through it, and how God sustained them. 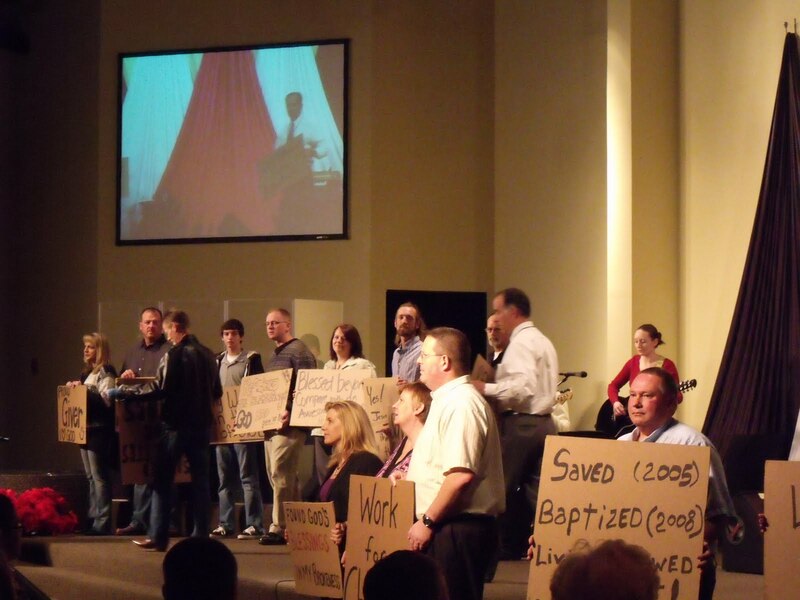 Then it will be followed up with the Cardboard Testimony as 25 others take the stage. Wow!!! 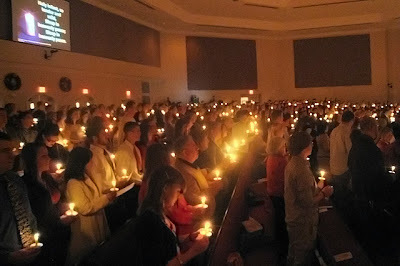 I’m pretty excited about the CHRISTMAS EVE CANDLE LIGHT COMMUNION SERVICE too. I’m pretty excited about the service on December 26th – THE YEAR IN PICTURES. Can a preacher say dang? Too bad. I already did. One of the hardest things about being a pastor is watching people self-destruct. It’s so unnecessary… because living in Christ offers us so much more. I’m working on my preaching calendar for next year. Looking forward to tackling some tough books of the Bible. Melinda said, GREAT Testimony in church this morning! Terri said, I cried several times. It's awesome to see people trusting in God, even through the yuck. It brings an amazing peace. Butch said, I belong to an awesome church, PCC. Cathy said, Today's church service was right on target...experiencing peace with God and the peace of God. Steve K. did a tremendous job sharing his testimony. Wow, how amazing is our God! Mary said, Courageous and Inspiring. That is Steve K...turning adversity into victory. There are many other life stories filled with heartache and tragedy within our PCC family. People who have hit rock bottom, exhausted from the struggle. In every situation when we stopped struggling and give it over to God, victory emerges. Quote of the day: Once we make peace with God, we have the peace of God within us. Carole said, Church today was awesome, singing and the sermon. Mr. Knowlton speech was wonderful. I admire him and his family. Every family there has a story to tell about their family. We all have family that has been involved in alcohol, drugs or any other abusive behavior. But with God it doesn't matter what you have done, he still loves us in spite of ourselves. God wants us to love just as he loves us, unconditionally. Denise said, Church today was amazing. What happens when let God work in our lives without constantly needing to see results is amazing! Thank you to Steve and Donna. Denise said, Wow on so many levels! Mike said, Church was full today. A family shared their story of God working in their lives. It was very touching. Ron does such a good job. I am proud to be a member of a church that cares!! Check back this week, I’ll be writing about things like possible changes in offering times, two services verses one service, and the things we think are working and are NOT working well at PCC. 1. THIS SUNDAY. The message is “A Time for Reconciliation.” A married couple from our church family will be testifying and telling their story. 4. SUNDAY, DECEMBER 26 – The Year in Pictures. This will be an end-of-year video that showcases all we did in 2010. There will be ONE SERVICE ONLY that day – 10:00 AM. 5. FIND A PLACE TO VOLUNTEER - PCC happens each week because of the awesome volunteers we have. As we look to 2011, there are areas you might consider getting plugged in to. God has given each of us unique talents and gifts that He intends that you use for His purposes. If you are a regular attender or member, who is in good standing, and financially contributes to this church, you could serve in our FIRST IMPRESSIONS MINISTRIES (greeter teams, café, hospitality, ushers, Welcome Center, security, or parking), FAMILY MINISTRIES (if you have a heart for children, all age levels), WORSHIP MINISTRIES (especially experienced guitarists) and a whole bunch of other stuff! If you’re interested, let us know. Letting go of a team leader (ministry worker or staff member) is always a drag. If it’s for cause, they still have friends and supporters in the church who won’t like it. If it’s part of a financial cutback, there’s a sense that this isn’t fair, and it isn’t. But perhaps the toughest situation is the release of a well-loved but ineffective member of the team; the C players who will never do anything bad enough to be fired or good enough to be rehired. In fact, it’s such a drag and so difficult that most churches don’t do it. Instead, they let inertia take over, with some complaining behind the scenes. It’s frustrating for all involved, but no one knows what to do. Too much effort and emotional energy is poured into endless conversations trying to make everyone “feel good” about being let go. It’s a waste of time. It will never happen. It reminds me of the girl who breaks off a dating relationship and says, “Let’s still be friends.” It might make HER feel good to say it. But everyone knows, friendship is not in the cards. One of the most common mistakes pastors and leadership teams make is to extravagantly praise someone who has just been let go, especially in a church wide letter or farewell event. While I understand the social pressure to do so, it’s a lot like the hollow praise you hear at a scoundrel’s funeral. The end result is a loss of credibility. I learned this the hard way in the past when I heaped extravagant praises upon a worker who had to be removed for ineffectiveness, and who I was glad to see go. While I was simply trying to be kind, I came off as hypocritical, especially to all those who knew the whole truth. I’ve since learned not to pump sunshine – that is, praising someone in public who I have criticism for in private. Credibility is too important to be squandered away in a feel-good meeting. I’d rather have people think I’m a bit of a cold fish than have them think I am a liar. That doesn’t mean we have to be brutal. We should be kind. And if I can honestly find good things to praise, I will. But it is a big mistake to leave people wondering why we had to let someone go when they have been led to believe this person was an exceptional performer. One of the best ways for ministry workers and church staff to experience greater fulfillment is to give them new roles. We should never be afraid of reassigning people or of being reassigned ourselves. New roles offer new challenges, which are opportunities for personal growth. Another advantage of moving staff and team members around periodically is that it stimulates growth by keeping things dynamic. Change produces tension and tension produces growth. If the same people are filling the same roles year after year it can result in stagnation; people have a tendency to become entrenched and put themselves on “cruise control” just maintaining the status quo. It should be apparent that some changes are taking place at PCC. This is beginning at the top and is working its way throughout the church. For instance, a visible change in my role is occurring on Sunday mornings – I am not playing in the band every week, another musician is filling my role there. I am now playing one half the time that I used to play. Eventually, I will develop a teaching team to assist me with teaching on Sunday mornings on a consistent basis. 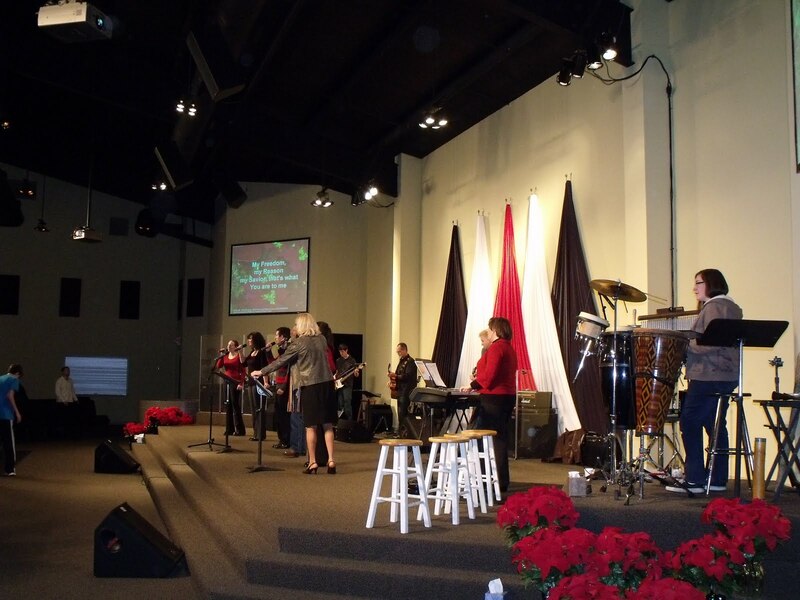 In addition, three worship teams have been formed, with each team serving one month each. This process has involved enlisting new musicians and new singers. Many of these positions are also cross-trained. The end result of these changes is that Pace Community Church will eventually have three highly capable worship teams of singers and cross-trained musicians all of whom can fill one another’s shoes and lead this church in the absence of anyone else. This is a good thing because it makes our church stronger and not dependent upon any single personality. Even as recently as one month ago there was a leadership change in the teen ministry. The baton has been passed from Renae to Denise Y., who is now doing an exceptional job in this area. More changes will be occurring in other areas too: reassignments of personnel, restructuring our ministries, room reassignments, and more teenagers being deployed to serve in the ushers department, as greeters, as teachers in our children’s ministry areas, and even to help with security. Why do we do this? Why not leave things alone? Here's why: (1) Some areas simply need to be fixed or improved. (2) It creates new opportunities for new people.... you know, God's own people whom He has given gifts to. (3) It strengthens the church by having a larger cadre of trained minsitry workers to rely upon, which means PCC is not dependent upon (or held hostage by) any single personality. (4) It keeps things dynamic. Fresh eyes add new perspectives and insights. (5) It's a God-thing. Change always creates push back. People don’t like change. But as a leader, my choice is clear. Either I can slowly kill off the future of our church by allowing the status quo to remain on cruise control, or I can bite the bullet and start moving people around. There is no easy way to do this. Asking someone move to another seat on the bus almost always leads to hurt feelings or even conflict. But there is no other way to make room for other talent. No one ever decides to change roles on their own. Over the course of 2010 we have been making changes, improving systems, training and delpoying new people, and starting new ministry teams. Some of these changes have been visible, others behind the scenes. Even though some of the transistions have not been easy, they have been well worth the effort. It has resulted in a fresh wind of insight, enthusiam, and new ideas - none of which would have been heard or heeded if these new people were made to sit on the sidelines. That’s what happens when you make room for others. Although it is never easy, it seems like every time I’ve asked someone to move over to squeeze someone new in, the pain and the push back on the front end has been well worth the rewards on the back end. While much has been done, there is still more to do. I am confident that 2011 is going to be our best year ever! The painter paints. The viewer views. The author writes. The reader reads. The musicians play. The listeners listen. In each case, the artist is responsible for only 50% of the transaction. How the person engages the art is their decisions. And this is something that none of us can control. Some people respond positively. Others negatively. It’s their choice. I think the same principle is applicable when we share the gospel. When we share our faith, part of the responsibility is ours and part of the responsibility rests with the recipients. This applies whether we are witnessing to one person or preaching to hundreds. This reality should be liberating. As long as you are faithfully doing your part, you don’t have to feel the full weight of responsibility for the other person. Some people feel like it’s their fault if they have family members or friends who are lost. They want to have complete control of 100% of the transaction. But the truth is, we can’t. No person has complete control over how other people respond to the gospel. It’s good to feel the weight of other people’s souls. But it’s bad to carry around the weight of their free will. That’s carrying their 50%. It can be frustrating. There are going to be times when you want more for the people you are sharing your faith with than they want for themselves. But still, you cannot have 100% control. You can only control what you do with your 50%. Give them room to exercise their 50%. Hire ministry leaders rather than ministry doers. There is never enough money to hire all the people needed to “do” ministry. There is simply too much to be done, and the temptation is to hire the person who is getting it done by themselves. A better choice is to hire a leader who can put together a team. The church is like a sailboat – we raise our sails to catch a wind. The wind is the Holy Spirit. The task of church leaders is to figure out where the Holy Spirit is leading and then get yourself pointed in that direciton. You raise the sails, catch a wind, and ride it as far as you can. When the sails are fully inflated, momentum is good in the church, growth is occurring, and God’s blessings come upon certain programs and ministries. It looks like it’s going to last forever. Eventually the wind stops blowing and the sails lose air. You’re dead in the water. The task of church leaders at times like this then becomes discerning which direction the Holy Spirit is now blowing and then turn the bow of the ship in that direction. To do this, you have to lighten the load, cut ineffective programs, and get rid of excess baggage. You raise the sails again, and if you are pointed in the right direction you’ll catch a wind. They will snap full with a loud pop. Then you ride it as far as the Spirit takes you. How does this look (in practical terms) in church work? Simple. You do an annual evaluation of everything going on in the church. If it’s ineffective, you can it. If it’s fruitful, you renew it. 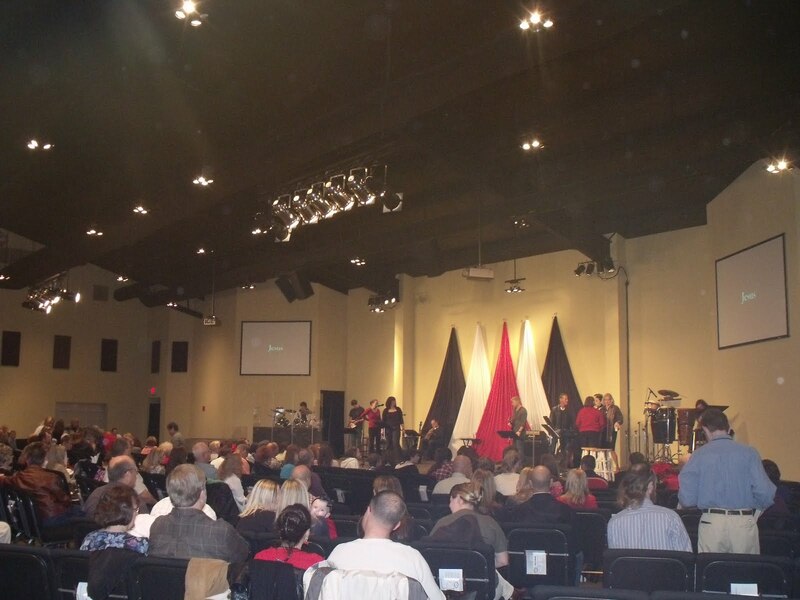 When we started offering two services it was for two primary reasons: (1) to continue growing, and (2) to provide a worship service for the workers in our age-level ministries who miss because of being on the work schedule in the back. After volunteering in one service they could attend the other, and would never have to miss a church service. (1) Growth in the second service has reached a plateau, and we lack the critical mass (enough attendance) to gain the necessary momentum to fill the room. 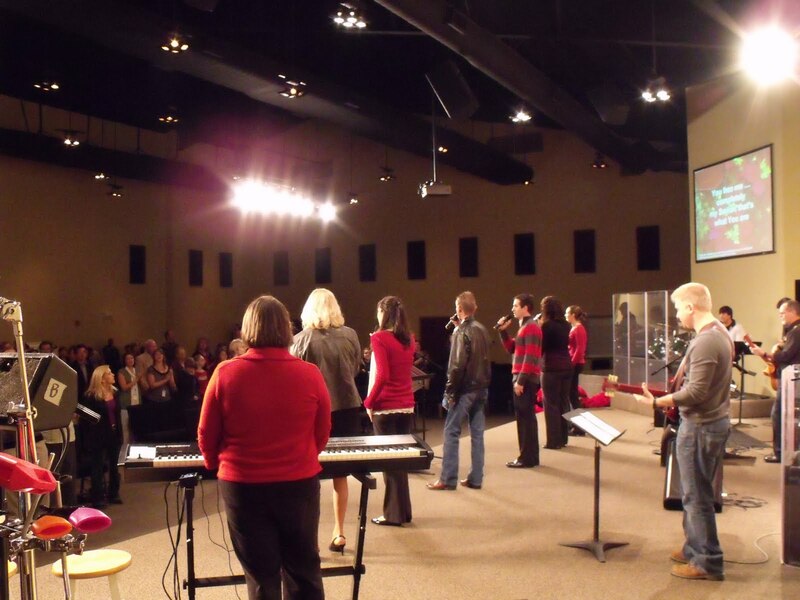 (2) Many of our church workers don’t even attend the second service after serving in the first service. They simply leave. There’s not much point for us to continue offering a church service that people don’t take advantage of. This matter is on the drawing board. 2. Get infused with our "DNA"
3. 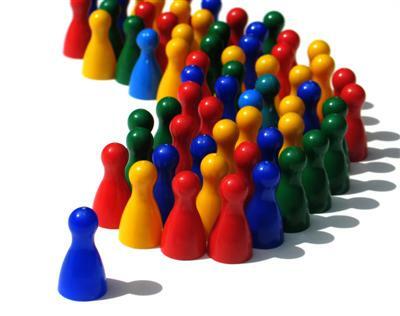 Multiply other leaders with the same DNA. It’s great that you know what’s happening in Seattle or Saddleback, with Matt Chandler or at Catalyst, but it's much better that you know what's happening in your own church. Get in touch with THEIR spiritual growth needs, hurts, pains, and fears. Know the condition of your flock better than the state of the blogosphere. 1. The Purpose Driven Church by Rick Warren. I stumbled across this book by accident in a run down Christian bookstore in Lake City FL back in 1996. I had never heard of Rick Warren, but purchased the book because it piqued my interest. Without exception this book did more to change my perspective on the ministry, church life, how to cast a vision and establish strategies for a church than any other book I have ever read. I was growing discouraged in the ministry and was actually considering leaving. But after reading this book, I came back to my original call which was to be a church planter. Within eighteen months of reading this book, I resigned my church and moved to Santa Rosa County and planted PCC. 2. Rediscovering Church by Bill Hybles and his wife Lynne. This book tells the story of Willow Creek Community Church. Bill and Lynne are absolutely transparent as they share the hardships, scandals, and even marital pressures they experienced while planting this church. Bill also tells the story of a difficult chapter in his church’s history that they call “The Train Wreck.” God used this book, second only to the Purpose Drive Church, to prompt me to pull the trigger on church planting. 3. On-Purpose Leadership by Dale Galloway. This book teaches pastors how to break through glass ceilings and the status quo. Full of anecdotes and practical advice, it is a must-read. In fact, I have read it about five or six times. It talks about delegation, multiplying leaders, coping with difficult people, and handling criticism. A very good book for me. 4. The Issachar Factor by Glen Martin and Gary McIntosh. Based upon I Chronicles 12:32 which says, “The Sons of Issachar understood the times and knew what Israel needed to do”, this book addresses the absolute need to change ministry methods when they are no longer effective or have become outdated. As a pastor, this is one of the best books I have ever read regarding ministries within the church. It covers topics likes such as: Worship, Leadership, Administration, Staffing, Outreach, Assimilation, Children’s Ministry, Youth Ministry, and Christian Education. 5. Go Big by Bill Cornelius. This is a thin paper back book, but it is the biggest little book I have ever read. I purchased it back in 2006, and have been carrying it with me, almost daily, in my book bag ever since. It is an absolute gem. Some of the topics are: Structuring Your Church for Growth…. It’s Time to Lead, Pastor!... 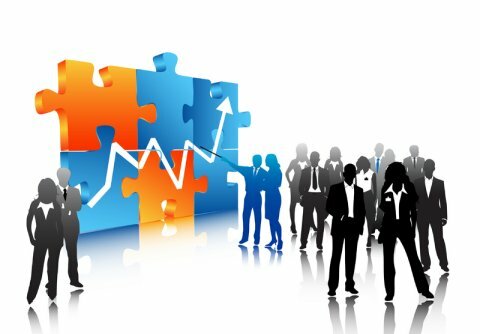 Staffing the Church for Growth… and Double Your Vision. Of course there are a lot of other good leadership books in my library that have helped me too. Plus I have devotional books, commentaries, and spiritual growth books. All of them are good! But these five stand out. I’m in the camp that believes leadership is a spiritual gift. I also believe that God bestows this gift on a variety of people in the Body of Christ. Pace Community church is changing lives. It has, without a doubt, saved mine. OMGish. What a great day. First of all it was very enjoyable for me to not be so visible. I didn’t play in the band, and my message only lasted about fifteen minutes. This means other people filled the gaps, which is a good thing for our church. I just knew deep down it was going to be a good day. I had an inner calm before the service began. 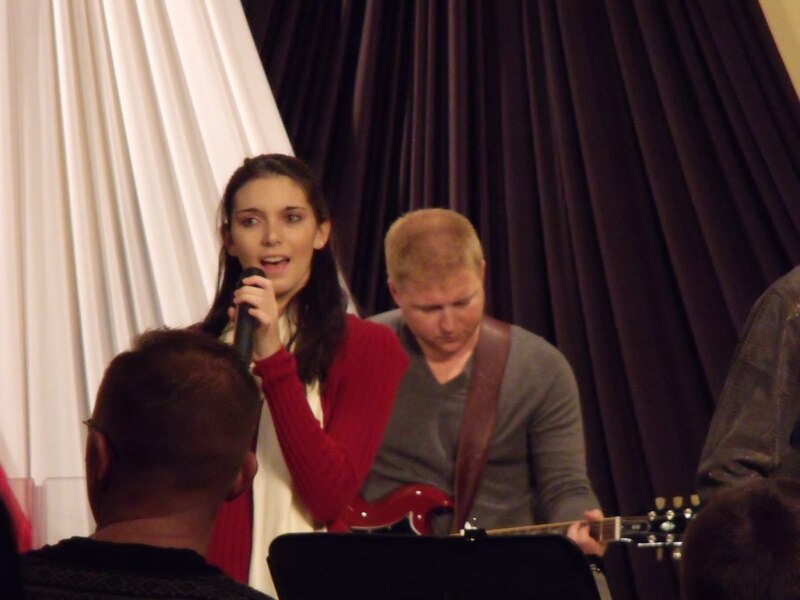 A new worship team was on stage today – half the singers were brand new. They hit it out of the ball park. Robert Lewis, who cut off his thumb and mangled his left hand in a table saw accident three days ago, was also on stage today. What a trooper. There’s a lot of people who wouldn’t show up for work with an injury like that, but he came to church! Gotta love it. Some people stay home over nothing. Some people come to church overcoming everything. Terri Ferro testified today. She hit it out of the ball park too. What she said was very convincing. Not only did I enjoy listening to her, I noticed that there was hardly a dry eye throughout the congregation. Even some of the ushers were crying. My only regret? I wish someone had taken a picture of Terri while she was on the stage speaking. We struck a nerve…. a real nerve…. with today’s approach in the service. Here are a few comments from Facebook…. Alyssa says, Church at PCC was amazing again today... we were given a SAVIOUR because that’s what we needed. Amen! Ask me and I'd be happy to explain more about the sermon. For unto us a child was born... Thank you God for our greatest gift! Sharon says, The service was awesome(as usual) this morning. Thank you Terri for sharing your heart with your "church family." Sidney says, Terri Ferro, you are one amazing woman! Thank you for sharing your journey with God today! J.R. says, I totally agree with Mrs. Sidney and Mrs. Terri. I am happy to call you a friend to me. Mary says, Well...another FANTASIC day at PCC. Terri's testimony was heartfelt and inspirational. When you think your own issues are overwhelming, just listen to the many challenges so many of our fellow PCCers have experienced and had victory over all with the power of God. Can it get any better? Just wait I know it can and will! I can't wait to see what God's going to do next!! Christa says, WOW!!! Again is all I can say about what is happening at PCC right now!! Terri's testimony was amazing!!! What an inspiring Woman she is!!! Ron's message was fantastic, I hope that man knows he can teach!! I learn something EVERY Sunday with out fail!!!!!!! God with us!!!! Kim says, Terri, thank you so much for sharing your testimony today. You did an awesome job at telling your journey and I know that you touched many hearts. That is not an easy task. You inspire me!!! Susan says, I think we all needed tissues today. Terri was a very brave soul in front of everyone and did a fantastical (that is a word LOL) job! Cheryl says, I was so proud of Terri, and especially pleased to hear my daughter say how she was glad she came to church today to hear Terri's testimony. Way to go God! NEXT SUNDAY we will be privileged to listen to ANOTHER TESTIMONY from a MARRIED COUPLE in our church family. You will NOT want to miss this! 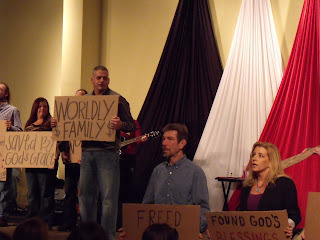 The following Sunday (Dec 19), another testimony from a married couple, plus the cardboard testimony. Wow! A lot of people made personal sacrifices today. Of course, that happens each and every week by scores and scores of people at PCC. But think about this. Terri F. sacrificed by telling this very painful and personal story of hers, reliving the experience as she did. Not an easy thing to do. Robert L. also sacrificed by attending church and helping to lead worship with a severely injured hand from a table saw accident. Why do people do things like this? Because they serve a great God and are committed, that’s why. Our church is full of people like this. Thank you to EVERYONE who sacrifices so much to make PCC possible. My blog went over 150,000 this week. I never thought it would get this high. 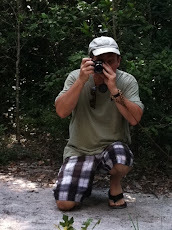 I’ll be posting on this blog every day this week. I’m writing about leadership a lot right now, (which is a big help to our church’s leaders), plus there is a lot going on at PCC, so be sure to log on every day. We have a good church. I'm glad that I belong to it. WE'RE DOING IT AGAIN on December 19th. BRING A GUEST TO CHURCH! It's been two years since we last did this. It's time to do it again because there are so many more stories to tell. 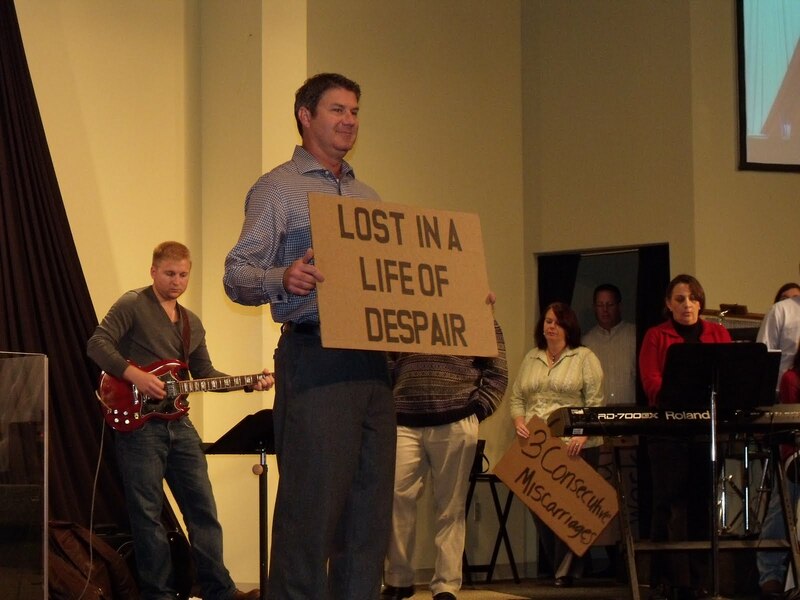 If you've never seen a cardboard testimony service, view this video to get an idea. This Sunday's message isTHE HOPE OF CHRISTMAS, and as part of the message I will have a family from PCC come to the stage and share a personal testimony of God's intervention in their lives. In fact, we'll be hearing testimonies from some of our PCC families every Sunday in December. YOU DON'T WANT TO MISS ANY OF THIS! It's gonna be a very memorable month of Sundays for PCC. If you would enjoy putting up & decorating the tree for the Atrium, we would love to see you here Friday morning (yes, this Friday) anytime between the hours of 9:00-11:00. We'd love to have the tree up & beautifully decorated by this weekend to launch our holiday services ... and with your help it can happen. Please come out and help if you can. Meet at OOPS ALLEY on Hwy. 90 in Pace, 4:00 p.m. This Sunday, December 5th PREVIEW & PRACTICE for Berryhill Manor Nursing Home Outreach. Saturday, December 11th BERRYHILL MANOR NURSING HOME OUTREACH 2:00 P.M.
MIDDLE SCHOOL CHRISTMAS PARTY - Wednesday, December 15th, 6:00 P.M.
Saturday, December 18th COOKIE EXCHANGE ...here in the Youth Room 200 - 4:00 P.M.
Sunday, December 19th --- a REALLY BIG DAY at PCC CARDBOARD TESTIMONIES. Also ... 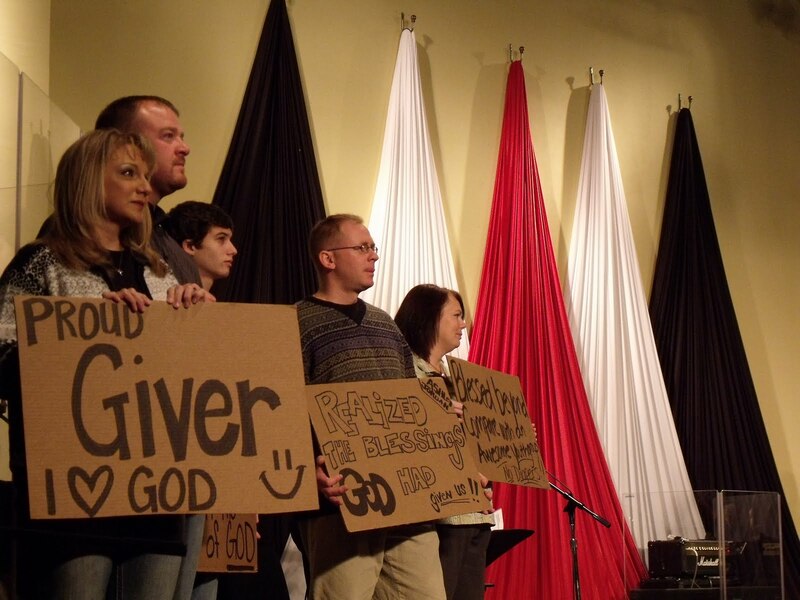 In December 2008, we did our very first Cardboard Testimony service, and people are still talking about it even now. You will not want to miss this very special celebration as we look back over the year and hear from people whose lives have been profoundly changed by the power of Christ. Mark your calenders, and invite your friends ... this would be a GREAT SUNDAY to get your unsaved loved ones here. 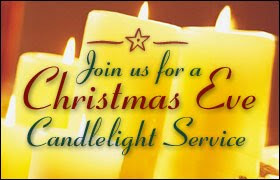 NOTE: If you are a PARTICIPANT in this presentation, please attend a brief meeting this Sunday, December 5th, after EITHER service (whichever one you attend) in the YOUTH ROOM, then mark your calendar for a DRESS REHEARSAL on Wednesday Night, December 15th, 6:00 p.m.
CHRISTMAS EVE CANDLE LIGHT COMMUNION SERVICE - Friday Night, December 24th. The entire servcie will last approximately 30 minutes, will be traditional, and include scripture readings. BRING A GUEST TO CHURCH EACH SUNDAY! Check back tomorrow for an announcment of what's going to happen in December at PCC. 1. When people are angry about something they vent their frustration on leaders. 2. When church members or couples are fighting each other, they want the pastor to referee or take sides. In the end, both sides end up mad at the leader. 3. Sometimes you will make a decision that will turn out to be a mistake. Sometimes disastrous. You will feel terrible about yourself. Your critics will love it. 4. Guess who gets to say “no” to a lot of things? Yes. It’s “the leader.” Sometimes you have to say no to friends who have good ideas, and sometimes you have to say no to not-so-nice people with bad ideas. It’s never fun, but it has to be done for the simple reason you can’t say yes to every request. There are too many. 5. When staff or ministry leaders are not performing well, guess who gets to have the “hard talk” that sometimes results in letting a person go? You guessed it - the leader. 6. When it’s time to conduct performance evaluations, guess who gets to do it? You already know. 7. Churches have budgets. Guess who gets to tell ministry leaders that their “amazing idea” is not allowed because it won’t fit into the budget? 8. Leaders have a bull’s eye painted on themselves in which people feel free to take shots at. These criticisms come from people they thought were their friends, or by people who have never met them. 9. If you are a church leader, you are scrutinized for everything you do or say. What movie you are seeing, what you wear in public, or whether or not you spoke to someone in Wal-Mart. 10. Since it is impossible to make everyone happy, someone is ticked off at you all the time. Not everyone who wants to be a leader can last as a leader. Think long and hard about a leadership role in your church before you enter one. If you can’t deal with the hard stuff, a leadership role can mess you up. Be sure God has gifted you and called you there. People who want to be leaders for the title or prestige do not last because those things don’t matter when the pressures of leadership show up. But hey, if you’ve got what it takes, then go for it. The church needs great leaders!